MDA volunteer invited to wedding of son of heart attack victim he provided life saving assistance to. About two and a half years ago, Avner suffered a heart attack and collapsed in a kibbutz in northern Israel. Avner stopped breathing and civilians who were there began to assist him and called Magen David Adom. 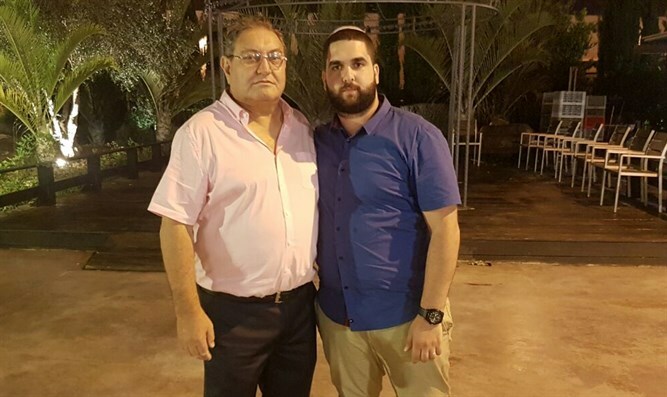 When MDA volunteer Shlomi Marciavik arrived at the scene, he saw Avner lying unconscious on the floor and immediately began resuscitation efforts. After a few minutes, the MDA intensive care unit arrived at the scene and performed advanced CPR on Avner. They continued to provide him with life-saving medical care until he reached the hospital. Avner was unconscious for another day after his heart attack. After he woke up in the hospital and began to recover, Shlomi came to visit him in the hospital and since then a special connection has existed between them, as if they were a family all their lives. Shlomi and Avner have kept in contact over the past few years. They talk on the phone every two weeks and Avner even holds a thanksgiving meal for Shlomi. Avner's son recently married, and he was happy to invite Shlomi and the rest of the MDA team which saved his life to the wedding. "The doctors at the hospital told me that I was in cardiac arrest for about 15 minutes, and the fact that I came back to life is not to be taken for granted," Avner said. "I thank God and the friends who were around me at the moment of the collapse and began my process of resuscitation and all those who gave me medical assistance and treatment that brought me back to life. They are all part of me. I'm glad I could celebrate this happy event with the people who saved my life. " Shlomi Marchiabik, the MDA emergency responder who provided the initial medical care to Avner, said: "Since the incident, Avner and I have had a unique relationship. When I received the wedding invitation, I was very excited and remembered the event. I am happy and proud that as part of my volunteer work in MDA I am able to save lives, and then to see these people celebrating with their family only reinforces that feeling." MDA Director-General Eli Bin said, "I was very excited to hear about Avner's story and the connection he created with Shlomi and Avigdor, and I am proud of the Magen David Adom people, who save people every day, especially as a result of the connection between these men. Incidents of this kind strengthen the sense of mission of the MDA forces who are in the field every day and who make sure to provide medical care to all."